She was lying there, holding the egg, when she felt the child move within her… as if he were reaching out, brother to brother, blood to blood. 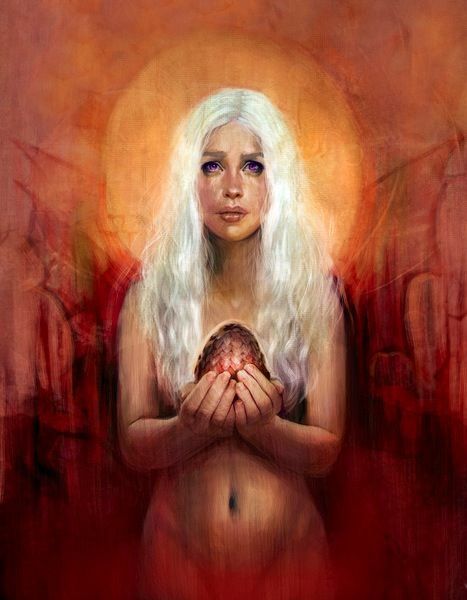 “You are the dragon,” Dany whispered to him, “the true dragon. I know it. I know it.” And she smiled, and went to sleep dreaming of home. “No!” Ned Stark screamed, clawing for his sword. Seven towers, Ned had told her, like white daggers thrust into the belly of the sky, so high you can stand on the parapets and look down on he clouds. Calm as still water, she told herself. Strong as a bear. Fierce as a wolverine. She opened her eyes again. The monsters were still there, but the fear was gone.